long-suffering, gentleness, goodness, faith, meekness, temperance, against such there is no law. Cut your watermelon out in the shape of a peacock. Take and spoon out some watermelon so your fruit can sit down in it.Take your bamboo skewers and layer your kiwi, grapes, and blueberries. Be aware that the kiwi had to be thick when doing this otherwise it will split it.Stick three toothpicks on top of the peacocks head with a blueberry stuck on the end of them. Take a toothpick and stick another blueberry on top of it and make this his eye. Stick it in the watermelon. Layer some extra fruit around the bottom of the Peacock. 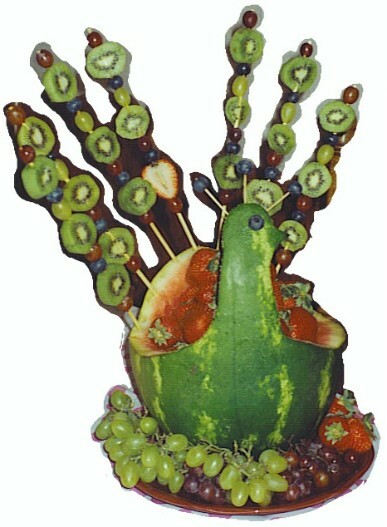 Now you have a Fruit of The Spirit Peacock. Teach the kids at church about the Fruit of The Spirit and what it means.